Background: Mother-to-child transmission of HIV-1 occurs in a minority of HIVinfected mother-infant pairs, even without any interventions. The mechanisms that protect the majority of HIV-exposed infants from infection are unclear. T regulatory cells (Treg) have important immunomodulatory functions, but their role in the fetus as well as in mother-to-child transmission of HIV is under-studied. Methods: We studied available cryopreserved peripheral blood mononuclear cells from HIVexposed infants from the Breastfeeding, Antiretrovirals and Nutrition (BAN) Study cohort in Malawi: 64 infants were HIV-uninfected and 28 infants were HIV-infected at birth. We quantified the frequency of Treg cells (CD4+CD25+FoxP3+), and activated CD4+ and CD8+ T cells (CD38+ HLADR+) by flow cytometry at birth, 6 weeks and 6, 9 and 12 months of age. Descriptive statistics were performed to describe the distributions of these lymphocyte markers according to the HIV infection status; and Student’s t tests and Wilcoxon-Rank Sum tests were performed to compare HIVinfected and uninfected infants. Results: T cell activation increased rapidly in the first 6 weeks of life, more pronounced on CD8+ T cells; a further increase in activation was observed at the time of weaning from breastfeeding at 6 months of age. In contrast, the frequency of Treg was stable over the first 6 weeks of life (median, 0.5%), slightly decreased between 6 weeks and 6 months (median at 6 months, 0.3%) and then slightly increased between 6 months (time of weaning) and 12 months of age (median, 0.45%). HIVinfected infants had significantly higher frequencies of activated T cells than uninfected infants (P < 0.01). 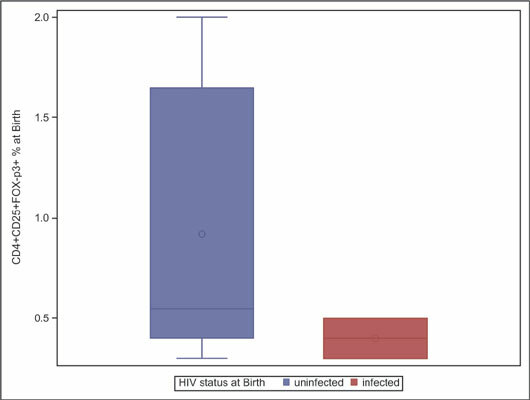 At the time of birth, HIV-exposed uninfected infants had higher levels of Treg, compared to infants infected in utero, even though this did not reach statistical significance in this small sample size (P = 0.08). Conclusion: This study provides initial evidence that Treg may play a role in preventing mother-tochild transmission of HIV, likely by suppressing immune activation in the fetus and infant, and needs to be substantiated in a larger study. Better characterization of the role of Treg in fetal and neonatal immunity may provide a valuable complementary approach to achieve eradication of mother-to-child transmission of HIV. HIV, mother-to-child transmission, Treg, regulatory T lymphocytes, neonate, infant.